We found 10 episodes of Teaching Python with the tag “python”. Sean and Kelly continue their conversation about the philosophy and ethics of machine learning and artificial intelligence in Python. This episode focuses more on resources and tools for AI learning after last episode's focus on philosophy and ethics. In this episode, Kelly and Sean talk to Joshua Lowe, a Python entrepreneur who invented Edublocks to help bridge the gap from Scratch to Edublocks and then into Python 3. Joshua started learning Python in 2013 and wanted to find a way to make Python easier for others to understand. 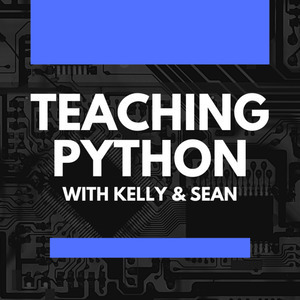 In this episode, Kelly and Sean meet Bob and Julian from PyBit.es to discuss strategies, and how to seek advice and motivation when learning Python. How do you know your students are really learning in Computer Science? In this episode, Sean and Kelly dig into developing the learner-centered classroom and some of the pedagogical philosophy of how to look for learning in your teaching. This week, we're joined by Peter Kazarinoff, Professor of Engineering and Engineering Technology at Portland Community College to discuss how adult learners can learn Python, the use of Jupyter notebooks as teaching tools, and some of the common goals of learners of diverse ages, backgrounds, and education levels.